John Kasich wins Ohio, keeps chances of a contested convention alive. Ohio Gov. 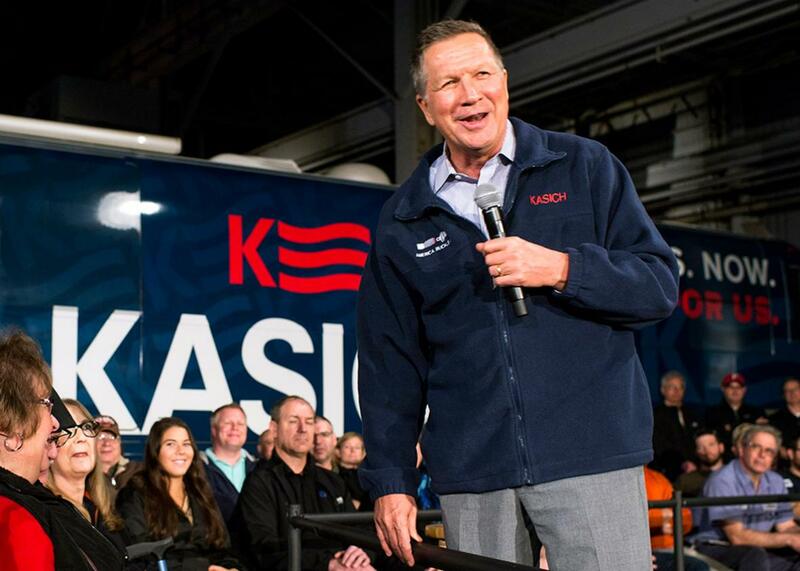 John Kasich speaks to supporters at a town hall meeting at Brilex Industries, Inc. on March 14, 2016, in Youngstown, Ohio. The Republican establishment’s fever dream of a Donald Trump–denying contested convention lives on. John Kasich won the Ohio Republican primary on Tuesday, avoiding what would have been a humiliating defeat in his home state and keeping Trump from a victory that could have turned the celebrity billionaire from the prohibitive GOP favorite into the presumptive nominee. Fox News and CNN both called the state for Kasich shortly before 9 p.m. CNN’s exit polls showed Kasich with 45 percent of the vote and Trump with 38 percent and Ted Cruz in a distant third with 14 percent. Marco Rubio—who urged his supporters in the state to back Kasich last week, partly in an effort to stop Trump and partly because he was already polling in a distant fourth place in a winner-take-all primary, and who dropped out Tuesday night—is expected to finish in last place. The outcome in Ohio means vastly different things to the different GOP candidates. For Kaisch, it provides a semi-legitimate reason to stay in the race and preserves his ever-so-slim hopes of snatching the GOP nomination at the Republican National Convention this summer. For Cruz, it means that he’s now unlikely to get the one-on-one contest with Trump he so desperately wants. And for Trump? It’s a little more complicated. Ohio was a missed opportunity for the GOP front-runner to take the wind out of the #NeverTrump movement, and his loss makes his road to the 1,237 delegates he’ll need to avoid a contested convention more difficult. But we’ll have to wait to see until the final votes are tallied in the rest of Tuesday’s delegate-rich contests to know whether it was a roadblock or simply a speed bump. It’s possible, for instance, that strong performances by Trump in Illinois and Missouri, where the primaries are of the winner-take-most variety, combined with a victory in North Carolina could be enough to keep him more or less on track to win a majority of delegates before the primary season comes to a close in June. Trump’s loss, though, will sting—and not just his ego. According to the number crunchers at FiveThirtyEight—as well as Benjamin Ginsberg, the GOP lawyer who helped write the delegate rules—without Ohio’s 66 delegates, Trump very well may arrive in Cleveland in July without the delegates he needs to win the nomination on the first ballot. And if that occurs, pretty much anything could happen on the convention floor. Still, even if Trump is unable to win a majority of delegates during the primary season, it’s looking increasingly certain that his rivals won’t either. Cruz has the second-most delegates, but he entered Tuesday trailing Trump by about 100 delegates and with his most friendly terrain—the Deep South, where he lost to Trump—in the rearview mirror. According to NBC News’ count, the Texan will need to win roughly 80 percent of the delegates remaining. Kasich, meanwhile, is more than a long shot; when he wakes up on Wednesday, it may be mathematically impossible for him win without a contested convention. By some estimates, he’d need to win 110 percent of the delegates up for grabs in the remaining contests for him to reach the GOP’s magic number. Expect Kasich and his friends in the GOP establishment to trumpet the Ohio results as proof that the #NeverTrump movement can, under the right conditions, stop Trump. But those conditions will be tough to find moving forward. Kasich is a popular sitting governor—he was re-elected less than two years ago by a nearly 2-to-1 margin—who had the local GOP apparatus in his state working on his behalf, and party elder statesman like Mitt Romney doing the same. His Ohio victory spared him a Rubio-style embarrassment, yes, but it’s hardly something to brag about.